The stuff it takes to be intimate is authenticity, vulnerability, and a belief that other people are about as good and bad as we are. And I’m learning these core values contribute to more than just healthy love stories, they contribute to healthy families, healthy parenting. I’ll be honest, my greatest fear is Betsy and I will have kids who don’t like me. I married later in life, so right about the time my Oreo habit catches up with me my children will be in their rebellious period. I have a recurring nightmare one of my sons will tell me what an awful dad I was right before I clutch my chest and keel over. Betsy hates it when I talk about it, but it’s a valid fear, I think. People are supposed to get married early so they can make it through their kids’ rebellious stages while they still have the energy. But my kids will be wearing leather and getting their belly buttons pierced while pushing me around in a wheelchair. I’m tempted to talk Betsy into having cats instead of kids, but she says we’ve got it in us and we can do this. Betsy thinks we can do anything. She thinks most of my fears are unfounded. I’ll try not to say I told you so when the kids tie us to the coffee table and use us as a conversation starter at one of their wild parties. If I’m comforted by anything, though, I’m comforted by the fact I’ve a few friends who have really great kids. I’m talking about kids in their teens and twenties who still love and respect their parents. My friends John and Terri MacMurray have three kids who love them. You’d think at least one would go bad. And my friends Paul and Kim Young have six kids, all adults now, and they still come over to the house and bring grandkids and nobody sprays graffiti on anything. My friends Ben and Elaine Pearson’s kids make a point to come over for dinner often and they never steal the silverware. I’m seeing it, you know. I’m seeing an outside shot that a healthy family is possible, that our kids might not grow up and use us as human shields in a string of bank robberies. I’m noticing a common characteristic of healthy families, though. The characteristic is this: kids with parents who are honest about their shortcomings seem to do better in life. What I mean is parents who aren’t trying to be perfect or pretend they’re perfect have kids who trust and respect them more. It’s as though vulnerability and openness act as the soil that fosters security. And I’d say that’s the quality I most often sense in the children of honest, open parents. I sense security. Sadly, I’ve noticed the opposite is true too. I’ve noticed parents who don’t admit their faults have children who are troubled and emotionally restless as though they secretly want to be free from their families so they can be themselves. Of course there’s no sure predictor whether or not kids will do okay in life. There are too many variables. But I believe vulnerability in parenting increases the chance a kid will grow up to become healthy and content in life. If you think about it, parents who are open and honest with their kids create an environment in which children are allowed to be human. And, sadly, parents who hide their flaws unknowingly create an environment where kids feel the need to hide. And feeling the need to hide our true selves from the world is rarely healthy. Some of the most troubled people I know were raised in fundamentalist environments with parents who felt the need to act more righteous than they were. I don’t know if I’ve ever met a person from a legalistic family who didn’t struggle. Environments in which we are encouraged to hide our faults are toxic. I’m hoping my kids will grow up being less impressed with me but more connected to me. And I’m hoping my kids will accept me as I am, flaws and all, even as I accept them. I suppose building a healthy family is possible. Maybe what children really need is simple. Maybe they just need somebody to show them it’s okay to be human. Excerpted with permission from Scary Close: Dropping the Act and Finding True Intimacy, copyright Thomas Nelson. 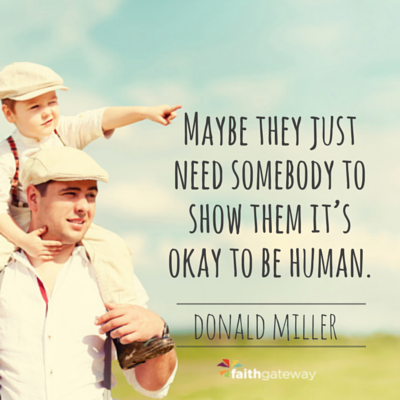 How often are you open with your kids about your flaws, mistakes, and sins? How often do you authentically apologize even if your sin was not against them or involving them? What kind of family relationship do you want to have and how can you begin to build it? Come join the conversation on our blog! We want to hear from you!